I really like to cook things that the onions can get involved with. I find they are more prone to try new things and eat more healthy foods when they are the ones doing the cooking. Plus I secretly pretend that I’m on my own cooking show when I’m walking them through the steps. I hope they actually retain some of what I tell them. I think they do. And I hope they remember these times when they’re sixteen and think I’m a the meanest, lamest mom e v e r and want to duct tape me to the washing machine so they can run off with their misunderstood and “actually very cool if you’d just get to know them” shaved, pierced and tattooed dropout BFF. 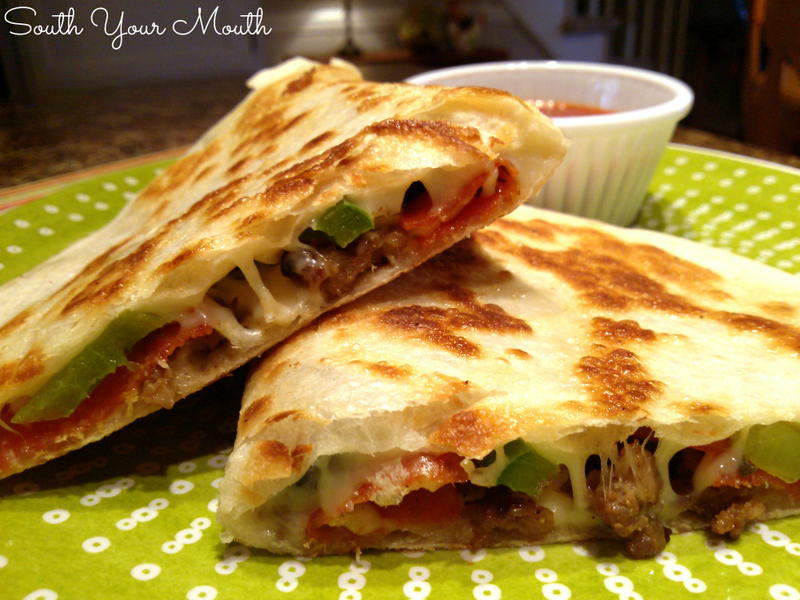 Though “pizzadillas” aren't a new concept, this was the first time we’d ever made them. And it turned out to be a great recipe for them to make themselves (with a little supervision from me, of course). And I liked that we got all the yumminess and flavors of a pizza without all the dough. This one’s definitely going in the regular rotation at our house! 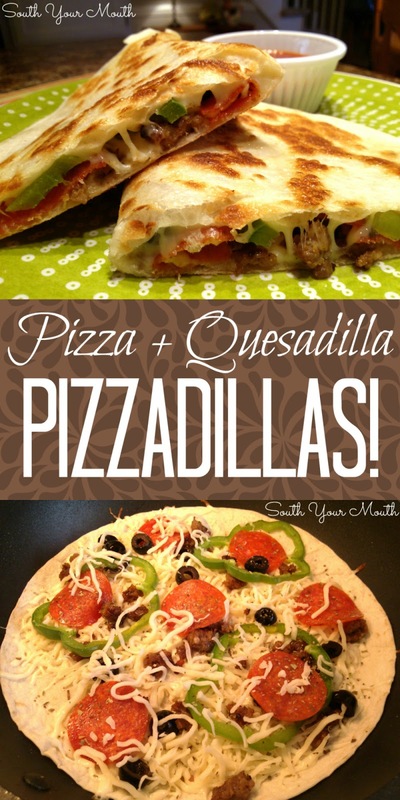 Prep all toppings and cheese and have them close-by as the pizzadillas cook quickly and you need to be able to get everything assembled fast. I set everything out by the stove in small ramekins (because they look great on my pretend cooking show). Heat large skillet over medium-high heat. Add about a tablespoon of olive oil and swirl pan to coat. Add tortilla to pan. Sprinkle with a little parmesan then a good handful of mozzarella (about a heaping cup). Sprinkle on a little oregano or Italian seasoning. Place desired toppings on cheese. Lift up one side of the tortilla after about 1-2 minutes to see if it has browned. Once it’s nicely browned and crispy, fold half of the tortilla over onto the other half. Remove from pan and cut into wedges. Must. Make. Right. NOW. OMG, my son will LOVE these!! His 2 favorite foods combined into one. Why didn't I think of this?? This is such a good idea! I am definitely trying this. Wow. These look fantastic. Thanks for sharing such a tasty recipe. This is something I could fix for just 1 person.I now live alone,and if I have guest i would just use full amounts. I want to make these soon!!! Do you put the topping over the whole tortilla or just half? I am concerned that when I fold it over it will fall apart? Thanks and cant wait to try this! The whole thing (see the photo above). The cheese melts and does a good job holding everything in place. Good luck! Do you find you have to re oil the pan every time between each pizzadilla? These look great! Could they be made ahead, wrapped in foil and reheated in the oven? I think I would like to serve them for club. so yummy... made these the other day... I also added mushroom. (you can really add anything you like on your pizza) just make sure you saute your veggies first...so easy to make.